This post is in partnership with RiceSelect and Mambo Sprouts, but all opinions and text is my own. Many years ago, while attending college, I spent my birthday away from family and birthday traditions. I was worried my birthday would be a big let-down without the usual festivities, so instead, I decided to do go totally wild and do what I wanted. That meant getting takeout from my favorite Thai restaurant, and eating it on the couch while I watched a movie (I am obviously a total wild child...). It was a memorable birthday, because it was exactly what I needed to celebrate that birthday. This one isn't a total copy either (maybe one day I will figure out how they make theirs' so sublime), but this recipe is marvelous! I love that it is vegetarian (or not, if you like meat), and that you don't have to have a yellow curry paste packet to make it. 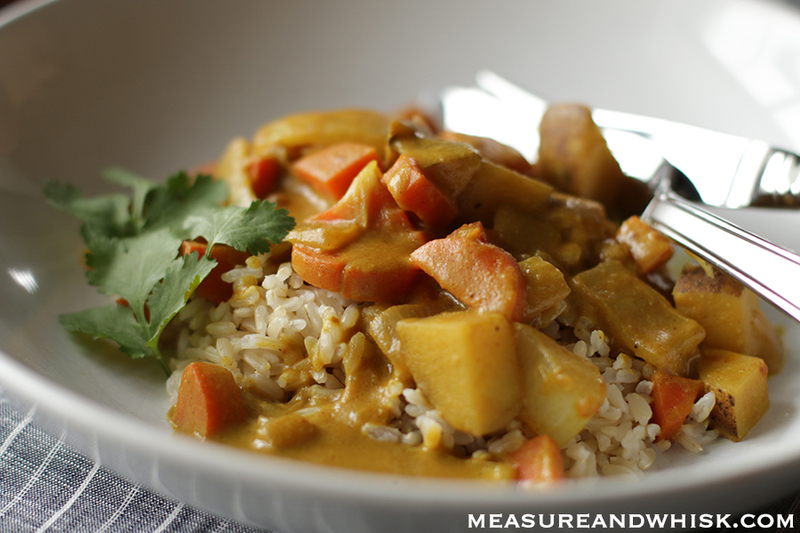 Feel free to increase the amounts of any of the spices that you wish, because that is part of the fun of curry. It is surprisingly playful and typically pretty forgiving. 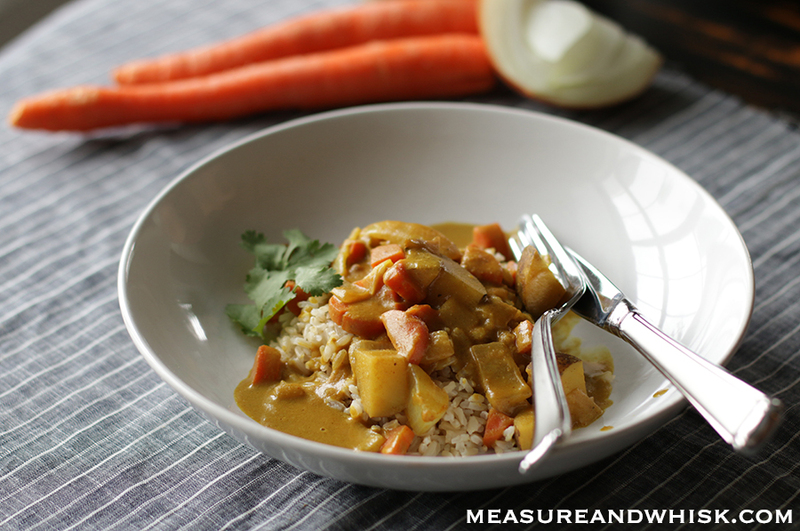 I also took this curry up one more notch by serving it with RiceSelect Texmati Brown Rice. It is a very good brown rice. I typically think brown rice leaves something to be desired, but this was really a lovely, hearty rice. As I have become more and more environmentally conscious, buying 'Grown in the USA' products has become much more important to me. 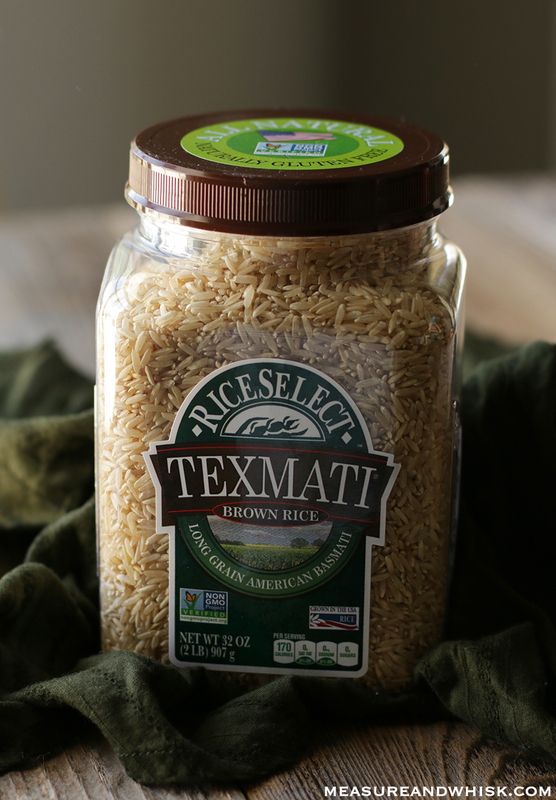 I love that Texmati rice is actually produced in Texas, is all-natural and non-GMO, so I feel great about eating it. It also holds its shape really well, and doesn't go all mushy after sitting for 10 minutes like many types of rice. Hooray for non-soggy rice! I am giving away 2 canisters of RiceSelect Texmati Brown Rice and a super genius tote bag that will be perfect for your adventures to the pool this summer (at least that is what I will be doing with mine, because it is so sturdy, huge and zips closed!). Just leave me a comment telling us what you will be making with the RiceSelect Brown Rice if you win, and your instagram handle or email, so I can contact the winner! Heat the oil in a large frying pan. Add the onions, and cook over medium heat for 3-4 minutes until they have begun to soften a little. Add the garlic, coriander, cumin, turmeric, curry powder and sugar and stir until it has coated the onions. Add the potatoes and carrots and continuously stir in the pan for 1-2 minutes. Now add the coconut milk, the vinegar, soy sauce and peanut butter. Stir for a minute or two until it is smooth. Add the water if needed, and let the mixture simmer for 15-20 minutes, adding more water if the mixture gets too thick, or doesn't cover the vegetables well enough. 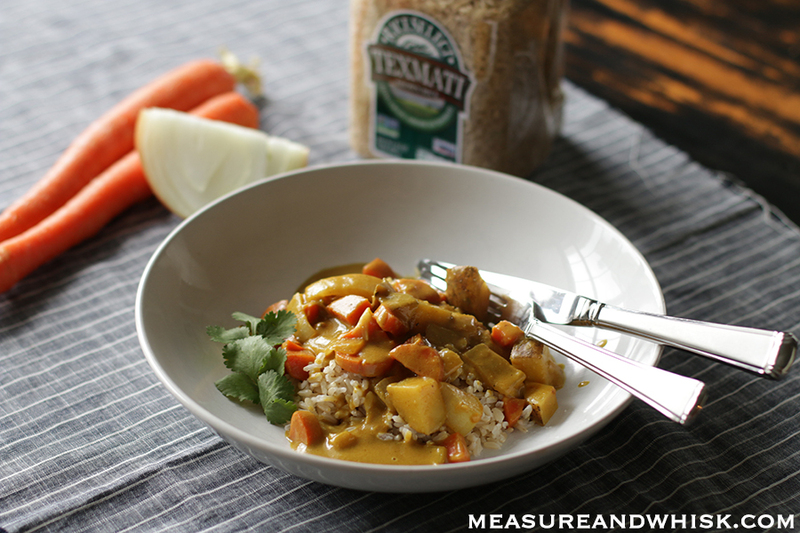 Keep tasting to see if you need to add more spices/peanut butter, because adding water will water down the flavor. 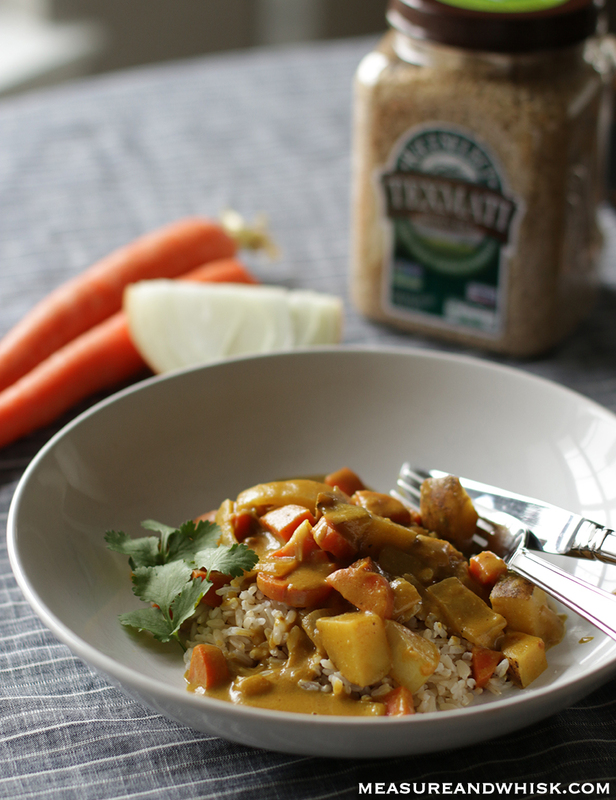 Once the potatoes and carrots are soft, remove from heat, and serve over RiceSelect Texmati Brown Rice. This will keep for 3-4 days, and is usually even better a day or two in as the flavors have time to meld. Enjoy! 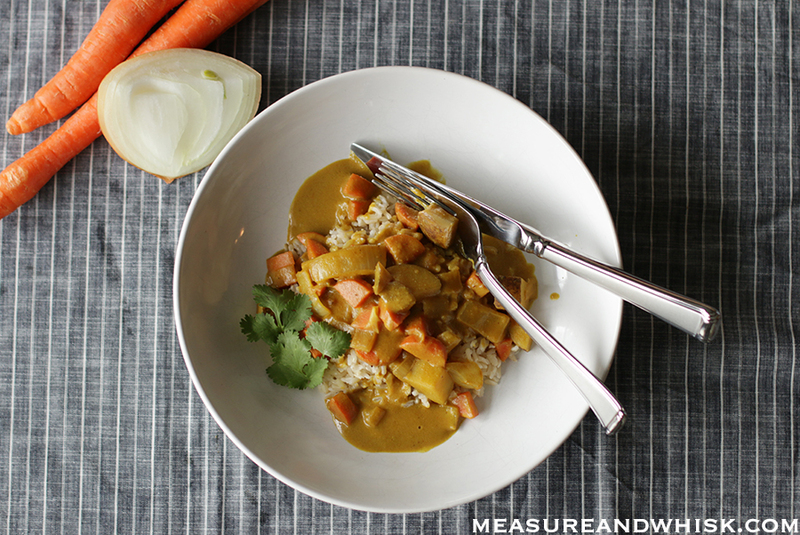 I think this recipe sounds delicious or my go to- Indian vegetable curry with homemade naan! My fiance is Indian, and I'm still looking for some dinner compromises. This sounds promising!! I would make fried rice! One of our favorites, firecracker chicken! I would make Cafe Yumm bowls (https://www.melskitchencafe.com/yum-yum-bowls/). I would make Mexican stuffed peppers :) blfallon (at) gmail (dot) com. My mom used to do creamed tuna a lot! It was the only way I would eat it! I just tried a new chickpea curry that a friend made that was a.maz.ing. Going to make it as soon as I get the recipe from the them! Oooh! Pass it along! I love a good chickpea curry! Sorry. Forgot to add email! I love a good rice casserole! I'll make up a big pan with whatever veggies I have on hand (inspired by your CSA posts!) and eat it for lunches all week. OOOh! i will check this out! Hi Landen ! I have actually never made curry at home ... But have been meaning to try it for a while, because a friend went to India and brought us back some indian curry powder... So your recipe falls right on point ! Just a small question : peanut butter is not something we eat regulary in France, and is not easy to find and kind of pricey... Any ideas of what I could use instead of peanut better ? What is the purpose of it, thicken the sauce ? Give taste ? Hi Claire! It is great to hear from you! I love that a friend brought you curry powder from India, because is is probably better than what we can get here! I do know that the French don't do peanut butter (a shame, really... it is a staple in our house). I like the flavor that peanut butter gives, and it adds a nice thickness to the sauce, but you could use something else instead. I can't guarantee results, because I haven't tried it with anything else, but ground cashews (cashew butter), would probably be good as well. If you can buy peanuts or cashews easily, you can always toast and then grind them up in a blender or food processor (or even cut them into tiny pieces) to make your own, if that is convenient (which is may not be). It will give you a less smooth texture than the store-bought stuff, but isn't hard. Good luck! Japan sounds amazing! Adam has always wanted to go there. So sad that you couldn't get into the Miyazaki Museum. It sounds amazing! Love RiceSelect. Can't wait to make this.